As early as 1929, this brilliant and charismatic physicist drew up designs for a cyclotron, which would accelerate hydrogen ions (protons) to create nuclear disintegration—that is, to “split atoms”—thereby producing new elements. The technology was essential to advanced nuclear research, and, during World War II, it proved to be critically important to the Manhattan Project, which created the atomic bomb. 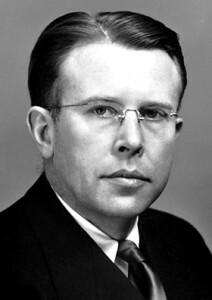 Lawrence developed an electromagnetic process for separating uranium-235 to produce the fissionable material at the heart of the weapon. A man of many interests, Lawrence also patented a picture tube for color television. He was awarded the 1939 Nobel Prize in physics, and the Lawrence Berkeley Laboratory at the University of California, Berkeley, and the Lawrence Livermore National Laboratory at Livermore, California, are named in his honor, as is element 103, lawrencium.